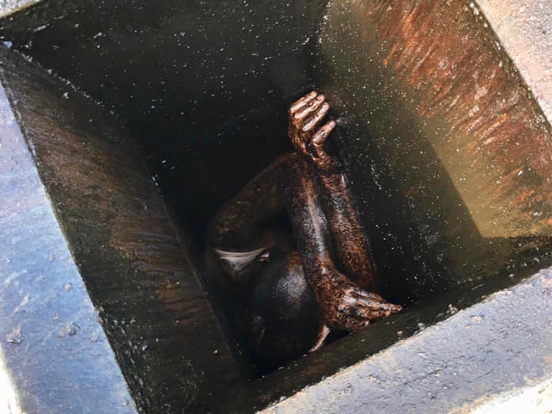 Man Is Freed After 2 Days Stuck In Empty Restaurant's Grease Vent "He's a pretty slender guy and based on the viscosity of the walls" and the attempt to remove his clothes, "he probably thought he was going to slide [right] down," officials said. That didn't happen. A man was freed after spending two days crammed into a narrow grease vent in San Lorenzo, Calif. Officials say he's not being charged with a crime. No one can say with certainty why the 29-year-old decided to climb onto the roof of the Chinese restaurant, strip off his bulky jacket and slide down the greasy vent wearing only a thin T-shirt. Sgt. Ray Kelly, a public information officer for the Alameda County Sheriff's Office, told NPR the man has been "less than truthful about his true intentions." But the objective seemed straightforward enough: "He's a pretty slender guy and based on the viscosity of the walls" coupled with the fact that "he took off his clothes, he probably thought he was going to slide [right] down," Kelly said. It seemed like a solid plan. Until he got stuck. It turned out it wasn't a straight drop from the roof to the floor. After making it about 5 feet down the chute, the 5-foot-9-inch man hit a turn in the vent, forcing him into a semi-crouched position with his arms reaching up, immobilized over his head. He stayed that way for two days. Trapped and unable to move in any direction, he started calling out for help. But his desperate cries were muffled in the layers of rancid oil that surrounded him until Wednesday morning, when he was discovered by the owner of a neighboring business. "I keep hearing this 'uh, uh' and I'm like, 'Who can it be?' " Igor Campos, who owns Campos Tax Services in San Lorenzo, Calif., told KGO TV. Campos explained that the unrelenting noise finally piqued his curiosity and he set out to find out the source. Kelly told NPR that Campos eventually walked around to the back side of the low-slung building until he was near the shuttered Chinese restaurant. "And that's when he figured out that there was a man trapped inside the ventilation shaft through the roof." As Campos called 911, he tried to find out the identity of the man in the vent. "I kept asking questions like, 'What's your name?' " Campos said. "And he said, 'Just please help me ... please don't hurt me.' I said, 'I'm not trying to hurt you, I'm trying to help you.' "
Getting the stuck man out proved to be fairly complicated. "The fire department had to figure out a plan of attack to get him out. We couldn't reverse course and pull him back up because the chute had sharp edges that would have cut him. Plus he was covered head to toe in grease — it was like he had been dipped in oil — and we didn't want to yank him up and have him slide back down," Kelly said. In the end, firefighters had to dismantle the steel ducting. The weather, the position of his body and the condition of the greasy vent had been brutal on the man. "Given another day, there's a good chance he may not have made it. He might not have survived much longer," Kelly said. When firefighters pulled him out, the man was dehydrated, exhausted, cold and confused. Also, because his arms had been forced over his head and he was in a squat for such a long time, his limbs had gone numb. He was transferred to a local hospital as quickly as they could load him into an ambulance. As of Thursday, Kelly said, the man is expected to make a full recovery. "He's all cleaned up and rehydrated," said Kelly, noting that it must have taken hours to rid the man of the "horrible smell." As for criminal charges, there aren't any for now. "We know sometimes suspects try to break into businesses to steal copper wire and plumbing and recycling for money. This appears to be something along those lines, but not every solution is jail," Kelly said, adding that a police report has been filed and that "he may be charged at a later time." "But we decided to be a little compassionate. We figured he's been through enough and it is in the holiday spirit," Kelly said.